Today we are excited to introduce Twilio Interconnect —a private connection to the Twilio cloud. For the first time, you can take advantage of Twilio’s SIP capabilities over an entirely private network connection. Interconnect works with both Elastic SIP trunking for deploying on-demand voice connectivity around the world and with SIP Interface for adding new capabilities to your voice applications. A private connection protects yours calls with network-level security, and can guarantee quality end to end. Since we launched Elastic SIP Trunking in 2014, thousands of companies have been using it to get instant global voice connectivity for their offices and products. Even more companies have used SIP Interface (launched in 2012) to add new capabilities and programmatic call routing control to their existing hardware and software. Before Twilio Interconnect, this SIP traffic could be encrypted at the application layer using SRTP/TLS over the public internet. But many folks do not have SIP servers which are capable of SRTP. Even if you did, the media path was still subject to the best effort performance of the Internet. Now, the calls between your infrastructure and Twilio can go through a private connection which guarantees security and enables you to control QoS end to end. There are a number of different connection options available. Which one is right for you will depend on where your SIP server is deployed, and what data networks it is connected to. 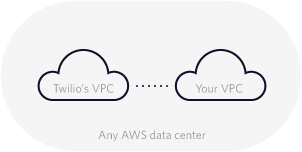 Network options where you are peering with the Twilio cloud offer both privacy and the ability for QoS control. If that is not possible with your setup you can get an encrypted connection over the public internet. Let’s first explore the three peering options. A physical, high speed connection to Twilio that provides extremely low latency and is dedicated exclusively to your traffic. Twilio supports customer cross-connects in Ashburn, VA and San Jose, CA at Equinix data centers. Additional global data centers are coming soon. Connect to Twilio using your existing private MPLS network. Twilio supports connections through the Verizon “Private IP” service, with support for more MPLS networks coming soon. An extremely low latency connection for folks already deployed on Amazon VPC, which keeps your traffic on Amazon’s private network. If those three peering options aren’t right for you, you can also use an encrypted connection over the public internet. A virtual point-to-point connection to Twilio through an IPSec tunnel that provides the functionality, security, and management policies of a private network. If your VoIP infrastructure already supports SRTP/TLS we’d recommend using that instead of VPN, because SRTP can be configured on demand through the Twilio portal. We’re excited about the ability to bring the full power of global phone number inventory and programmable voice capabilities to your infrastructure over private and secure connections. To get started with Interconnect, tell us how you’d like to connect. You can also learn more about using the different connection options in the docs and guides.